A new government program will allow eye specialists and their patients to choose between two drugs to treat several conditions that can lead to blindness, Health Minister Sarah Hoffman announced Wednesday. The program will save taxpayers up to $46 million over the next three years, Hoffman said at a news conference held to kick-off the new program. Both drugs used to treat the retinal condition under the program are made by the same company. One is called Avastin, and costs $13 to $50 per treatment. The other is called Lucentis, and costs $1,575 per treatment. Avastin has been used across North America as a lower-cost alternative for treating retinal conditions. Seniors who had to pay for their own Avastin will now save about $25 for each monthly injection, or about $300 per year, Hoffman said. The program allows doctors and patients to decide which of the two drugs to use during treatment. 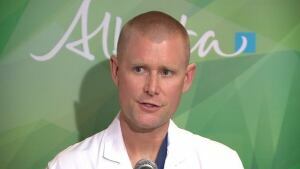 The Retina Society of Alberta will monitor the program and collect data about the effectiveness of the two treatments. About 7,000 Albertans will be eligible to take part in the pilot project, based on advice from their physicians. Avastin is a cancer drug and is not approved by Health Canada for use in treatment of macular degeneration. Hoffman said it’s up to manufacturers to apply to Health Canada to have a drug listed as a scheduled treatment for certain conditions. In such cases, the use of the drug would then be considered “on label,” which means the condittion would be listed on the label. Alberta is the seventh jurisdiction in Canada to cover the drug, Hoffman said. Ophthalmologist Dr. Matthew Tennant, who attended Wednesday’s announcement, said he and his colleagues have safely used Avastin in such treatments for years. Dr. Tennant, an associate clinical professor of the department of ophthalmology at the University of Alberta, said he started using Avastin in 2006, four years before the other drug was available. Recent research shows the two drugs are equally effective and equally safe, he said.